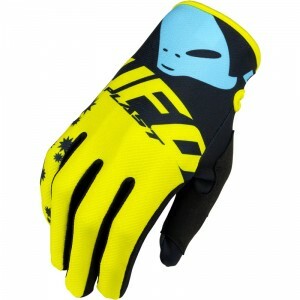 The complete UFO gloves collection is available at V1mx. The Italian company is a manufacturer of high grade offroad equipment for many years, which are used by many hobby riders as well as professional riders. The UFO gloves are tested by world champion Romain Febvre during the MXGP of 2015. The products are well developed for both comfort and protection which plays in favour of the rider. The use of Airnet Material in combination with clarion gives the rider cooling while maintaining perfect control and feel over the handlebar and levers. In addition, several areas on the gloves give protection to the rider. This combined with a strong closures offers offroad gear of the highest level. The 2016 collection includes: Punk, Trace, Iconic and Cluster. You also can choose to buy a full gear set including the gloves. The gear sets with matching pants and jerseys are available for a very competitive price.